There are quite a few free PlayStation emulators out there from which to choose. Out of the ones we tested, PCSX and ePSXe were the most compatible and fastest. We decided to go with ePSXe because it was faster than the others, very popular in the community, and still being developed (as far as we can tell). This is the main ePSXe interface window. 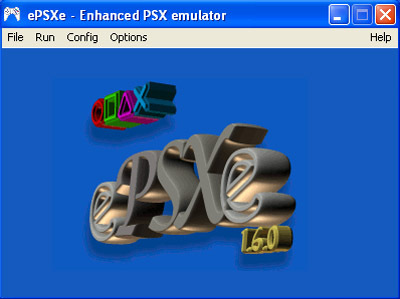 The PSEmu Pro (a discontinued free PlayStation emulator) plugin standard, which ePSXe (and many others) uses, allows the main emulator to separate itself from the very long list of hardware that it would otherwise have to support. The PlayStation emulator is free simply to emulate the core of the PlayStation while offloading sound, graphics, and I/O to different plugins written for different hardware and operating system environments. Sure, it's possible to get some degree of functionality out of pure software plugins, but why not take advantage of hardware accelerated OpenGL, DirectX, or even Glide based graphics plugins? Smart CDRom plugins can implement aggressive caching and read ahead in order to speed up CD load times; controller plugins can take advantage of all types of joysticks and gamepads. Rather than simply relying on the CPU to emulate an entire system (as was the case with older emulators), we can make use of our entire PC. Depending on what we want to do with our emulator, the graphics subsystem can be fairly heavily taxed, even making use of some pretty cool pixel shaders. Let's take a look at what goes into PSX emulator graphics.